The latest frontal system has now passed and the winds are swinging to the east/southeast and while we continue to have chances at good fish the action on our fishing charters in Fort Lauderdale has slowed somewhat. 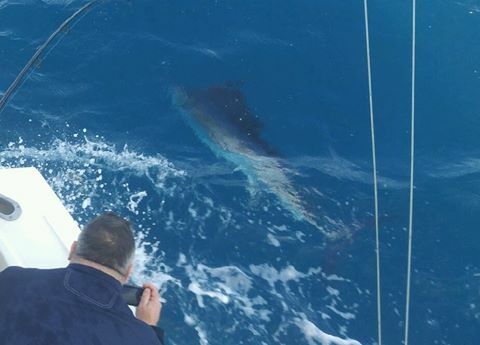 Still the same species offshore (Sailfish, Mahi-Mahi, Tuna some Kingfish and Sharks) but we are finding that many fish are now holding in slightly deeper water which involves a bit more hunting and covering some area to score. Sailfishing has definitely backed off but we continue to expect to see them offshore. As we said they have become more spread out as well and a very broad area from 90 to 450 feet of water depth is where they feel at home. We have been using live Ballyhoo and Mylar dredges often as this approach allows us to be somewhat more mobile than kite fishing and we can cover a large area (that 90 to 450 feet) with this method. With the expanded area of the Sailfish’s comfort depth zone there have been a few encounters with migrating White Marlin. Blackfin Tuna still a good possibility and a larger number of Bonito now mixed in with them. Some Mahi-Mahi moving through as we get closer to the expected run of these fish. The best bet for them remains closer to shore within the 100 fathom line and they like most other species this time of year are pretty much always on the move. 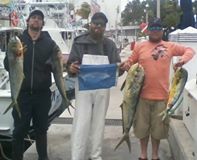 Wahoo are sketchy but not out of the question with once again the better sized ones preferring water inside of 600 feet in depth. Large Sharks continue to be seen in varying depths with some Hammerheads tailing in water from 120 to 500 feet of depth. Still those uncommon Thresher Sharks showing in larger than normal numbers but mostly in the typical depths of 300 to 400 feet. And it is “Mako March”. There’s a reason for that phrase. Grey and Golden Tile Fish and some Snappers on the bottom are all available to us now with the present slow down of the north current we have been seeing now for several days. 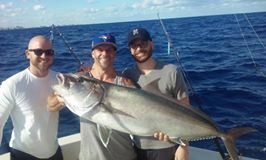 Here’s to good fishing and tight lines from all of us (Rick, Matt, Tommy K and JJ) aboard the “Marlin My Darlin”.